This board was used one time. 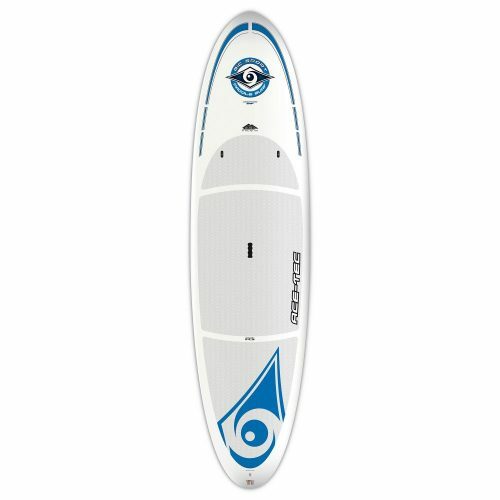 Designed as an all-around performer for light-weight riders, up to 180 lbs, in waves and on flat water, the Bic SUP Ace-Tec Stand Up Paddleboard is a highly versatile board that is particularly at home in waves. This board is also suited as a performance board for medium-weight riders, up to 220 lbs. The balanced rocker profile, smooth outline and progressive bottom contours lend themselves to surf performance without sacrificing flatwater glide. A fully convertible 2+1 FCS fin configuration allows the rider to optimize performance by matching fin selection for either surf or flatwater conditions. New ERGO-GRIP carry handle = Easier Transport + Less Fatigue! ACE-TEC is the ideal material for SUPs. It’s a composite of a polystyrene core covered with glass fiber and epoxy followed by a thermoformed finishing coat results in light weight boards that are rigid and highly knock-resistant. Premium quality without the premium price ! This line of boards is shaped for versatility, equally efficient in small waves and on the flat, delivering superb glide and excellent maneuverability.